MLJ is happy to introduce Tokyo Travel for Beginners for people who are visiting Tokyo for the first time. There are many must-see spots in Tokyo, but you cannot visit all of them if you only have limited time. So, MLJ has picked out the best travel spots which you can all be seen in just a couple of days. It’s best to visit Harajuku and Yoyogi Park on Sundays because all the cosplayers and performers only appear then, and on Sunday, there is a free market [FLEA MARKET??] in Yoyogi. So, we recommend the Shibuya Harajuku tour on a Sunday starting from Shibuya and Omotesando for shopping then heading to Harajuku to check out the cosplayers and performers (they appear in the afternoon), and fishing at Meiji Jingu Shrine. On weekdays, MLJ recommends travelling to Asakusa, Ryogoku and Akihabara in the east of central Tokyo. Generally it doesn't matter if you visit Asakusa on the weekend or on weekdays, but if you want to check out Kappabashi where you can buy kitchen supplies and fake food, bear in mind that these shops are only open on weekdays. Ryogoku is the center of Sumo wrestling. There are many Sumo schools and traditional food for you to try. When you visit the east of Tokyo, you must check out the world famous Akihabara where all kinds of Anime and game shops are located. It is also still the best place to buy electric home appliances and gadgets. If you want to see some historic spots in Tokyo, visit the Imperial Palace which is located in the center of Tokyo. The Imperial Palace has an Outer garden, Eastern garden, and Kitanomaru park. It was used to be Edo Castle, and is still preserved well in its original condition. 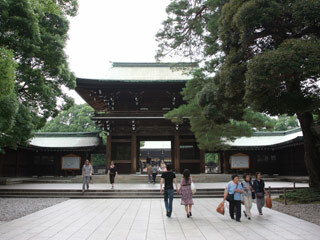 Also visit Yasukuni Shrine because it is located right next to Kitanomaru Park. Of course you can spend all day shopping in Ginza and Roppongi, and Odaiba is the one of the best tourist attraction in Tokyo. You should be able to visit all of these spots in three days.